Lake cruises in Branson offer passengers a great opportunity to see the beauty of autumn. Cruising on the lake is a great way to treat your family a wonderful vacation where you can have the chance to enjoy sightseeing cruises and scenic tours around the lake. Aside from world class entertainment, exciting attractions, museums, and theme parks that Branson can offer, it is also known for the natural beauty that surrounds it especially the colorful foliage of the season. From the pristine lakes to the spectacular splendor of the Ozark Mountains, Branson’s natural beauty offers an infinite variety of delightful colors of autumn on a day to day basis. The two beautiful riverboats that you can board with the Main Street Lake Cruises such as the Lake Queen is a replica of the historic paddle wheeler boat that used to travel the waters of the White River and the Landing Princess, a 100 foot luxury yacht that offers different options including dinner cruises and sightseeing tours on schedule throughout the day. A cruise on one of these river boats is always a fun filled adventure that offers beautiful panoramic views on the lakeside of the Ozarks not available on land adventure and even offer spectacular beauty and delightful color of the autumn foliage. An autumn cruise with any of the two river boats along the shores of Lake Taneycomo will take you through the most breathtaking scenery the Ozarks region has to offer and also allow you to see the best autumn color. To experience the fall foliage with lake cruises in Branson, you can choose to board from Branson Landing’s Lake Queen or the Landing Princess that will take you around Lake Taneycomo. Whichever river boat you choose will have you enjoying the peak autumn colors in style. 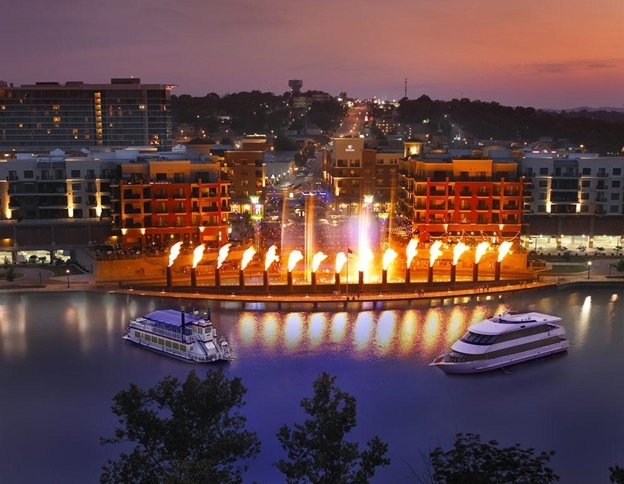 And if you choose not to cruise and instead enjoy a relaxing stay in the Branson Landing promenade, you will be able to enjoy a spectacular show of the Branson Landing Fountain which shows a synchronized display of light, sound, fire, and water. If you decide to take a cruise with the Lake Queen for a moonlight cruise, you will hear a narration from the guide the historical facts about Lake Taneycomo Bridge, Branson’s first music show, the Hillbilly Jamboree, and Baldknobber’s first roller-skating rink in Branson. This beautiful river boat also offers passengers a fantastic way to enjoy Branson’s wildlife sightings of American bald eagle, foxes, night heron, mink, and coyote on the lakeside. The luxury yacht Landing Princess is a perfect choice to experience a relaxing river cruise. The yacht has two climate controlled entertainment decks that allow passengers a magnificent view of the autumn colors from the deck. This luxury yacht also offers passengers delectable buffet meals and melodious musical entertainment while viewing a breathtaking beautiful lakeside scenery. So, if you want to enjoy a breathtaking cruise this autumn season in Branson, take a river cruise with your family with Main Street Lake Cruises in Lake Taneycomo.